Hohenzollern, Or Zolleru a princely family of Germany to which belongs the royal house of Prussia. 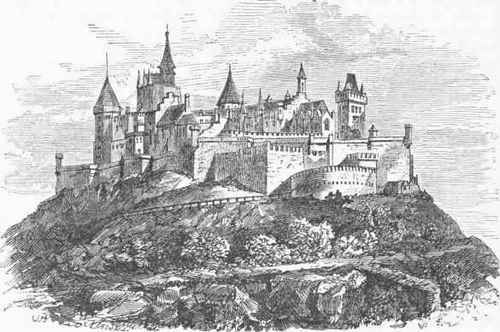 The name is derived from the castle of Hohenzollern, in the district of Sigmarin-gen, on the Zollerberg, a mountain of the Alps, about 2,850 ft. above the sea. Count Thassilo, about 800, is the remotest ancestor named, but the family name does not appear before the 11th century. The house was divided in 1226 into two branches. The Frankish branch acquired new possessions in almost every generation. Frederick V. (died 1398) was the first to bear the title of prince, which was given him by the emperor Charles IV. After several divisions the entire estate fell to Frederick VI. (died 1440), who in 1415 received from the emperor Sigismund the electorate of Brandenburg, and called himself as such Frederick I. His 11th successor, Frederick III., became the first king of Prussia as Frederick I. (1701). The Swabian branch failed to gain distinction before the 10th century. Count Eitel Frederick IV. (died 1512) obtained from the emperor Maximilian I. the domain of Haigerloch in exchange for the Swiss county of Razuns, which he had acquired by marriage.' His grandson Charles I. (died 1576) received from the emperor Charles V. in 1520 the counties of Sig-maringen and Vohringen. Charles's sons Eitel Frederick VI. and Charles II. divided the estates. The former took Hohenzollern, and adopted for his line the name Hohenzollern-Hechingen; the latter received Sigmaringen and Vohringen, and assumed the name Hohen-zollern-Sigmaringen. The son of Frederick VI., John George, was in 1623 raised by the emperor Ferdinand II. to the dignity of a prince of the empire, which was also conferred in 1638 on the Sigmaringen family. In 1695 and 1707 the Prankish and Swabian branches agreed upon a common law of succession, subsequently ratified by the king of Prussia as the head of the house. The treaty established among them the right of primogeniture, and provided that in case one of the branches should be without a male successor, the estates should be transferred to the other branch; and that in case both branches should become extinct in the male and female lines, the estates should fall to the royal house of Prussia. In consequence of the political troubles of 1848, the princes Frederick William of Hohenzollern-Hechingenand Charles Anthony of Hohenzollern-Sigmaringen resigned the government of their territories, Dec. 7, 1840, and the principalities, according to the treaty, fell to the crown of Prussia, which took possession of them March 12, 1850. The two princes received the rank of younger princes of the royal house. - Prince Charles Anthony of Hohenzollern-Sigmaringen, born Sept. 7, 1811, presided over the Prussian cabinet from Dec. 2, 1858, to March, 1802. His eldest son, Prince Leopold, born Sept. 22,1835, married in 1861 the infanta Antonia of Portugal. His paternal grandmother was a princess Murat, and his mother was a niece of the empress Josephine and adopted daughter of Napoleon I. On July 4, 1870, the provisional government of Spain proposed him to the cortes as candidate for the Spanish crown.